It's in one of Venice's oldest and least-touristed neighborhoods, which was settled by fishermen nearly 1,500 years ago. The location may seem isolated, but the hotel is only a short walk to the Campo Santa Margherita (one of Venice's liveliest squares). As a bonus, land taxis can reach the San Basilio cruise pier, making it easy to get close to the hotel from Venice Marco Polo Airport. The directions below may sound complicated, but the walk is short and easy (no more than five minutes from the ramp behind the San Basilio Cruise Terminal, with one low bridge near the hotel). As you leave the terminal's main entrance, turn left and walk around to the back of the building. On your right, you'll see park benches, flowering bushes, and steps. Walk a short distance, and you'll see a ramp leading down from the pier area. Walk down the ramp and turn left. Walk as far as you can go and turn right into the Salita San Basegio. Continue to the corner. Turn left onto the Calle Lardoni and walk a short distance until you reach a path that heads off to the right. Follow the path around the building, through the grass, until you reach a bridge. Cross the bridge to the other side of the canal. 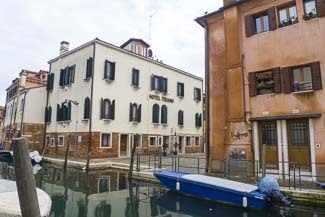 Turn left on the Fondamenta Barbarigo and walk a very short distance to the corner of Calle Rielo. Turn right into the Calle Rielo. The Hotel Tiziano will be just down the short street and on your right. Leave the secure port area through the gate at the west end of the pier. On your left behind the cruise terminal, you'll see park benches, flowering bushes, and steps. Look for a ramp that leads down from the pier area. Walk down the ramp and follow directions 3 to 9 above.